offer a tuition grant of $ 2,000.00 for two student. Total of $ 4,000.00 for two students. Our recommendation is to offer this grant to those students, that are outstanding in their performance and they are economically not able to afford the fees for the school. This offer is for the upcoming class of year 2013. We would also appreciate if the school would send us their full clinical backgrounds and one picture of each candidates for our file. There will be an Annual AMAA Members meeting on December 9th, 2012 at The Peacock Restaurant in Diamond Bar, CA. The meeting will be held from 11am-3pm. A lunch buffet will be served. In the name of the most gracious and merciful Almighty God. On behalf of the Afghan Medical Assocation of America, I am privileged to have the opportunity to talk briefly about our great friend Dr. Gordon Hadley in this memorial service. First of all, I would like to express my deepest sympathy to Dr. Hadley’s family, his closest friend Dr. Ibrahim Seraj, faculty members at the Department of Pathology, and to the entire medical staff of this great university. Since there are other speakers, I would like to focus my talk about Dr. Hadley’s passion to help Afghanistan. Dr.Hadley first came to Afghanistan from India in 1958. He started teaching at Kabul University School of Medicine. His first assistant at that time was Dr. Erfan Fetrat, who was a Pathologist. The Department of Pathology was one of the weakest departments in the medical school. Dr. Erfan was trained by Dr. Hadley and offered the first scholarship to Loma Linda University. His Pathology syllabus was translated to Farsi. He became the pioneering linkage between Loma Linda University and Kabul Medical School. 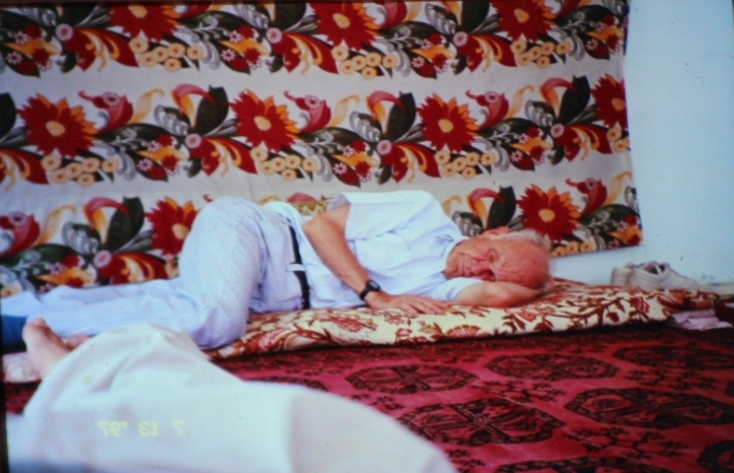 On his second trip in 1963 he resumed his teaching in Kabul Medical School. His second assistant was Dr. Ali Siddiqui. He revived the Pathology Department and a syllabus of Histology was published. He hired a German technician, through the WHO program and trained her to modernize the department. The record taking and file management process was established. With such efforts the department of Pathology has now became the strongest deparment in the Kabul Medical School, thanks to Dr.Hadley’s persistent efforts. Dr. Hadley arrived in the late 1960’s to Nangrahar University and started teaching at Nangrahar Medical School, where I was attending medical school as a student. 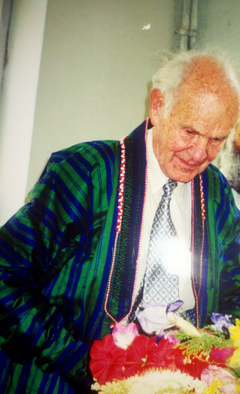 Dr. Hadley not only taught but also helped the department of Pathology, as he did for Kabul Medical School. He also helped the public health hospital in Jalalabad. Through out the years while he was retired, his passion and dedication did not let him rest, instead he had numerous trips to Afghanistan. 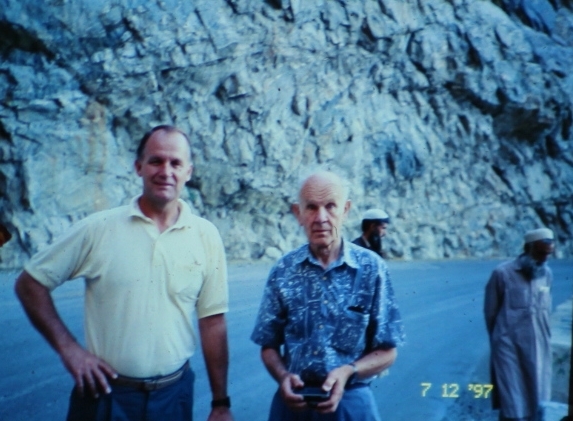 Dr.Gordon Hadley on the way to Jalalabad 1997. Dr. Hadley did not hesitate to travel back to Afghanistan on several occasions, even at the most difficult times. I had the honor to accompany him in one of his trips in the year 2000. In addition he was also accompanied by our other members on several other trips. He has trained many students in both Universities, and he was very proud of them. Here in Southern California Dr. Nafisa Abdullah, Dr. Khushal Stanisai, Dr. Rabani Zaheer, Dr. Ali Siddiqui, Dr. Ragbir Bir, are some to name. They are here tonight with other Afghans including Dr. Borhan Ahmad, Dr. Mohammad Osmani, Dr. Abdullah Sherzai and others. A week before his illness, while he was visiting Dr. Seraj he sincerely wished to go back to Afghanistan. This was his last conversation with his closest friend, before he passed away. Dr. Hadley, not only helped Loma Linda Univserity but his passion to help humanity did not recognize any boundaries. His help and wisdom extended to India, China and Afghanistan. Specifically his help for the past five decades in Afghanistan is very well recognized by the entire medical community inside Afghanistan. Dr. Hadely, you had so much love, passion, and dedication to help the Afghan people. I know you are not physically among us, however your soul is here watching us . On behalf of the entire Afghan Medical Association of America, I would like to tell you, that we love you so very much, you have a special place in our hearts and minds . May God bless you so very much. This weekend we are deeply sorrowed to hear of the passing of one of our close friend and mentor, Dr. Gordon Hadley, he was 91. Dr. Gordon Hadley passed away a week ago last Friday afternoon. Dr. Hadley was a former dean of the Loma Linda University. He had dedicated more than 30 years of his life to teaching and mentoring Afghan physicians at Kabul University and at Nengrahar University Medical School. He had numerous trips to Afghanistan, during his active duties as well as during his retirement, to serve for the improvement of the health system in Afghanistan. We would strongly encourage the AMAA members to attend the memorial services which will take place on July 7th at 7:30pm. Located at Loma Linda University Seventh Day Adventist Church. You can read more about Dr.Hadley, his life and accomplishments here.